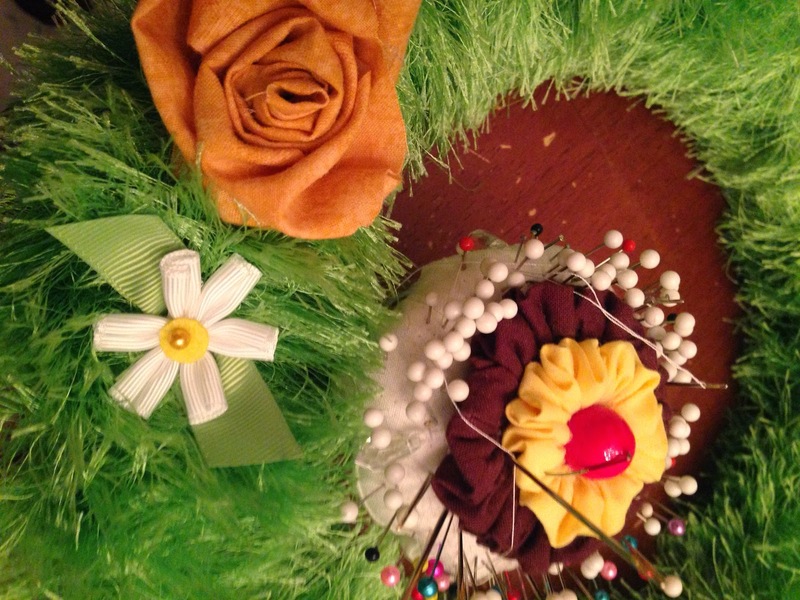 Today is the first installment of a week long series of posts around my shabby chic Easter celebration for Sunday. You may remember that I did a shabby chic bridal shower a few years ago and I always love doing shabby chic styled parties! I think in a past life, I was an old Victorian lady. I love piles of vintage old lace, floral fabrics and mismatched old, pretty, floral China. And I wanted to make this Easter special because my godparents are leaving for Italy this summer for good and this will be our last Easter together. Usually Italian Easters are around the food and I'm not skimping on that (for fear of my mother's wrath) but I'm going to add a whole other layer of shabby chic fabulousness to the day! I am decorating the house a little nicer and having some more beverages and treats that will make everything more special. The issue is that as you know, I do work full time. So I'm trying to do a lot of prep work and searching/shopping weeks ahead of time so that I can achieve the celebration I have in mind. This is post #1 and there's a few things I have done to date. For the shabby chic look, I need lots of vintage stuff. SO I've been trolling thrift stores finding scraps of lace and scraps of fabric, old linens, old table cloths and old vintage mismatched plates. Today I'm laundering whatever linens that I have found and cleaning whatever plates and bowls I will be using for Sunday. As far as food prep, I'm defrosting frozen cake that I've saved to make bunny cake pops tonight (thanks to Wilton for sending me lots of decorating goodies to make these a snap!). Over the weekend I made Easter soup and a Bolognese meat sauce. So last night I froze the final Easter soup and also assembled a crêpe lasagna to freeze along with extra sauce. Come Sunday, those are ready to go. Also while thrift shopping I found two baskets for the kids for Easter. And the other thing I'm going to do today or tonight is dig up all of my stored Easter stuff and look through it, pull out what I'm going to use and what I'm going to store away. Part of shabby chicness is a lot of crafting, and I am prepped and ready for what I am making this week to help make the house more fabulous. My Pinterest board is quite helpful in all of this! SO was a few trips to Joanne fabrics (coupons in hand). 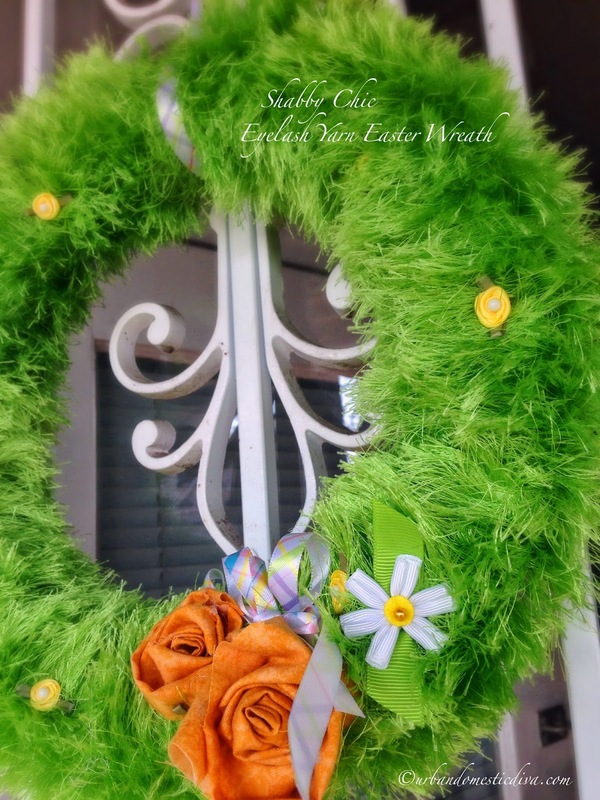 So on the docket of crafting fun today is a fun eyelash yarn wreath, already on my door to welcome a very slow start to spring. 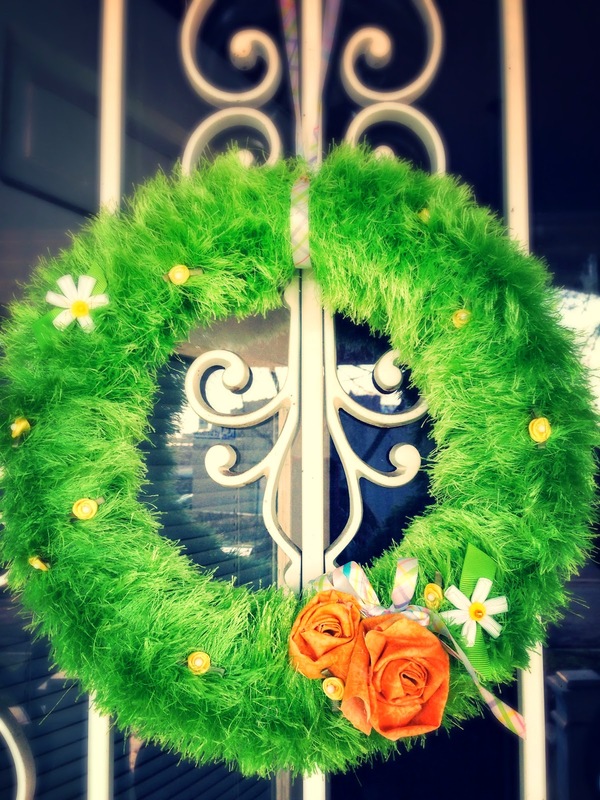 Here is how to make one for your door. 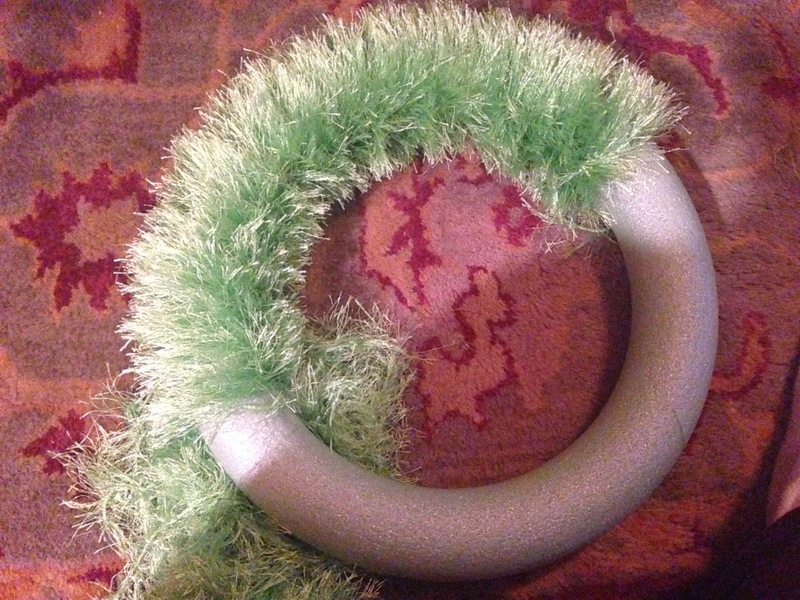 I saw this on Pinterest using eyelash yarn which looks like grass and it was super cute! I wanted to make a version with my own style. Next post up, look for bunny cake pops! 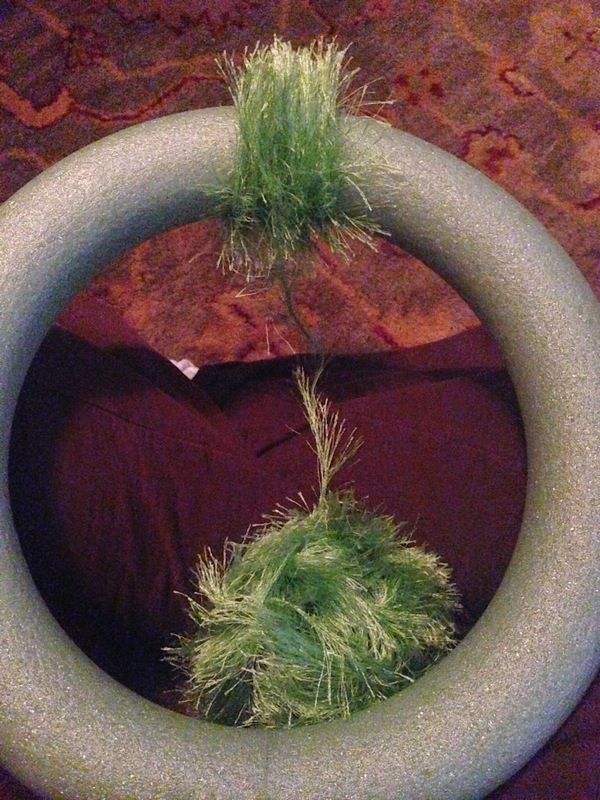 Carefully wrap the wreath ring with eyelash yarn, pushing yarn close together as you wrap it around so that it looks bushy and full. Knot the end tight to finish. With your scrap fabric, cut a strip about 12 inches long or shorter (depending on size of your flowers-the longer the bigger). Fold fabric down horizontally in half and wrap fabric around itself similar to how to make felt flowers or fleece flowers (and this post here explains that more clearly). 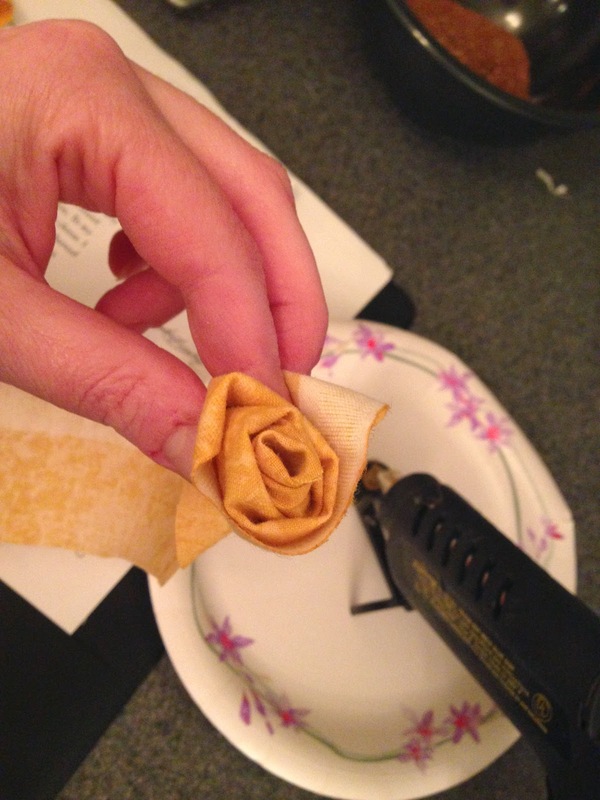 Create 1 to 3 flowers in the scrap fabric, and connect ends and bottom with hot glue. 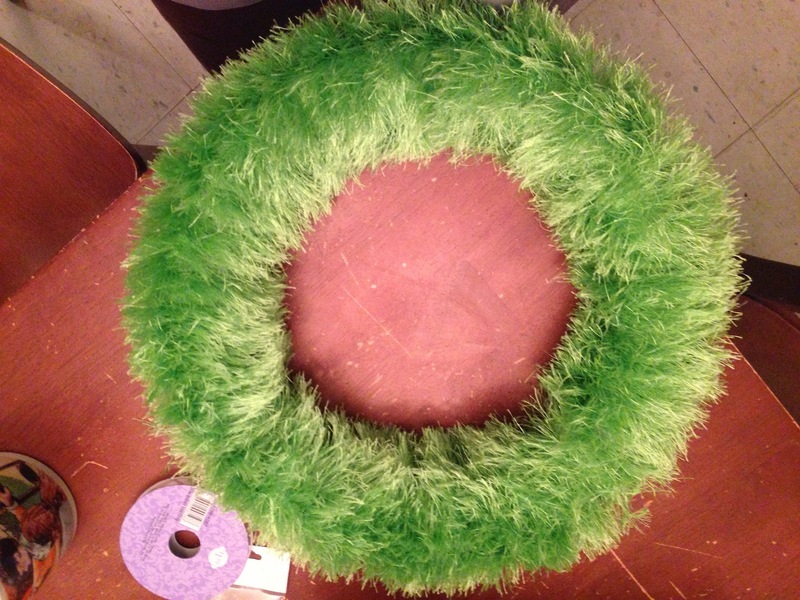 With hot glue, glue onto areas of the wreath, and try and create a bunch in one area for a focal point. 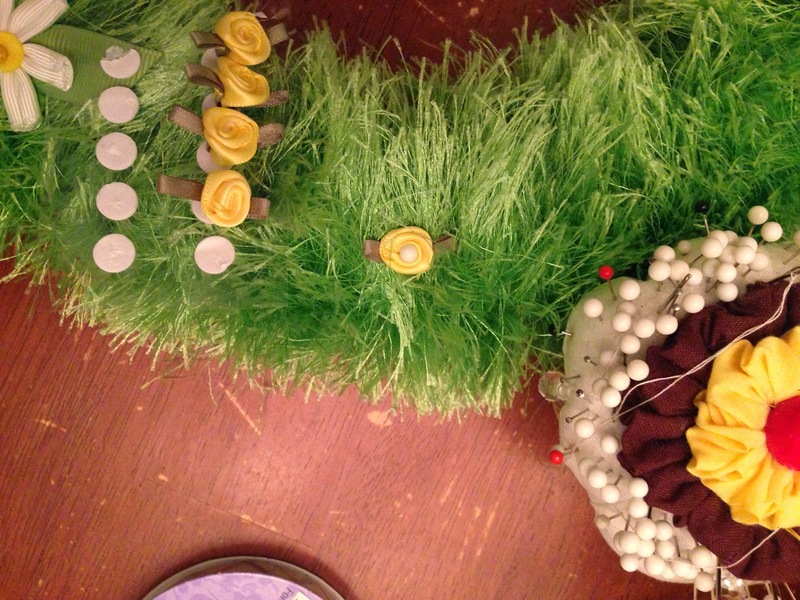 With the smaller ribbon flowers, pin them throughout the wreath, using the colored pins at the center of each flower. These act as a beaded middle and allows the flowers to nestle into the yard. 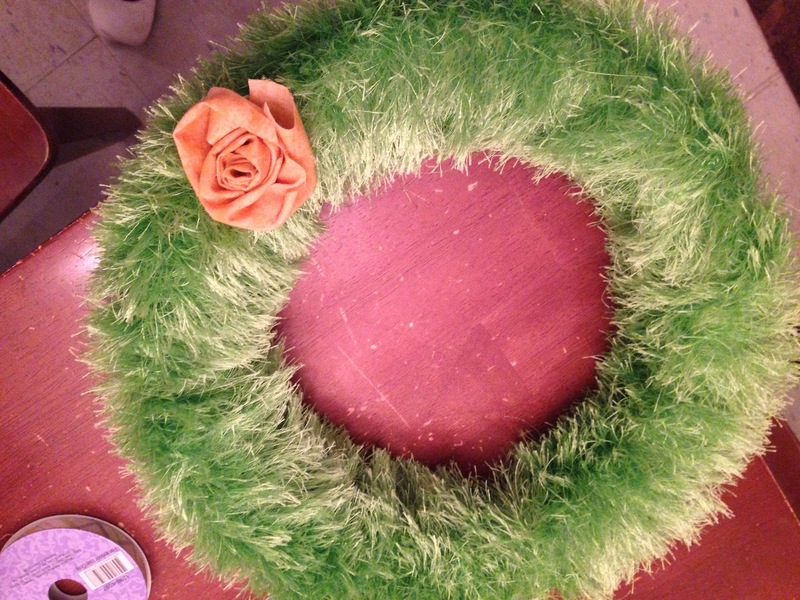 Place some symmetrically around the wreath. 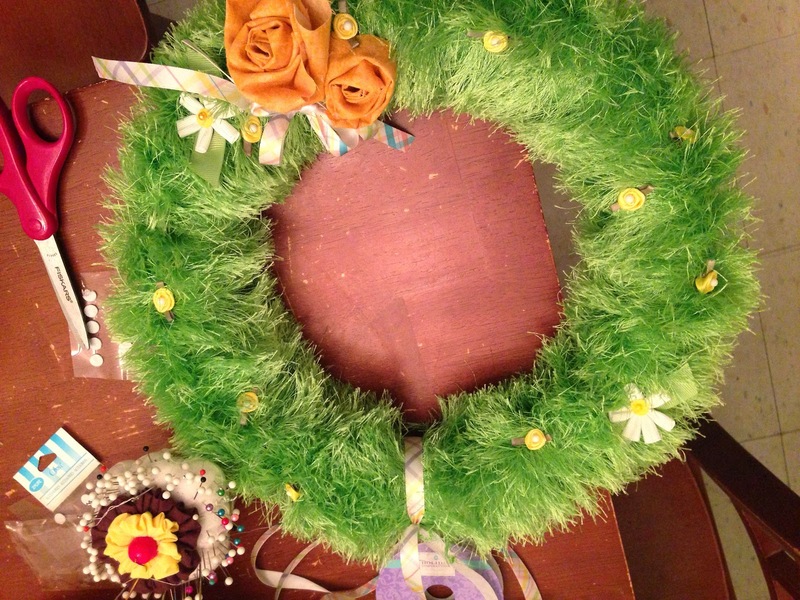 Using your Easter ribbon, tie a long hanging piece on the top to hang on your door. 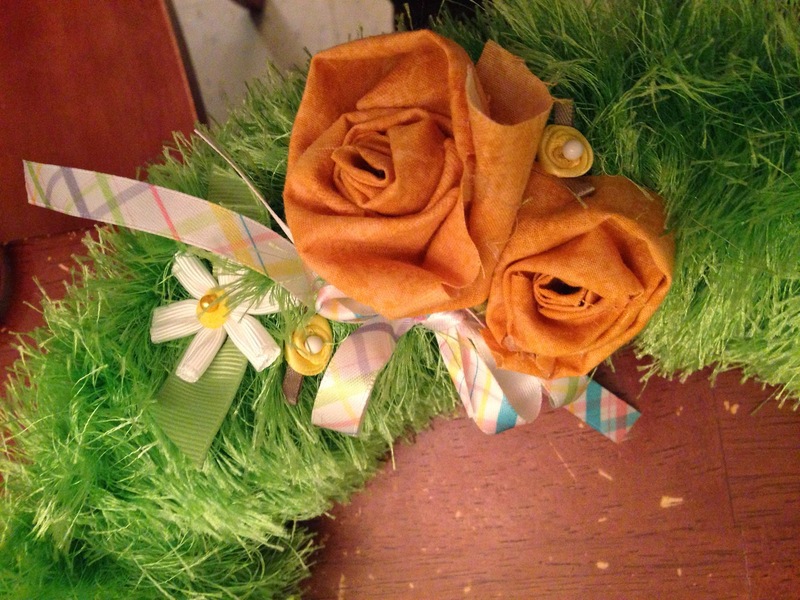 If you have extra, use a bit to add a flouncy bow around your fabric flowers, helping to create a focal area. Hang it on your door and enjoy!